The BEST Juicer, Is there one? Often times, we are asked, "which is the best juicer?". Choosing a juicer is like a choosing an outfit to wear. If your going swimming, you will wear a bathing suit. If you are going to a formal occasion, you will wear an tuxedo. Choosing a juicer is much the same. You must match the juicer to what you intend to do with the juicer. There are several "styles" of juicers available on the market today. Some are better suited for juicing certain kinds of produce than others. There is no "perfect" juicer that will perform every juicing operation with equal quality. Please evaluate your needs carefully before purchasing an appliance. This article is based on our experience, and is accurate as possible, if you have any questions, please visit the FAQ. * I always recommend people purchase organically grown produce whenever possible, especially when juicing produce items, skin and all. Even better than buying organic is growing your own produce. Vegetables on the other hand have fibrous, "tough" cell walls, requiring more aggressive mechanical juicing action than fruit. Due to their low acid content, it is recommended that vegetable juices be consumed within 15 minutes of their preparation, since it has been demonstrated that enzyme activity in juice 30 minutes may be less than a fresh juice. When apple or carrot juice turns brown, it has oxidized and the nutrition has lessened. Juices that are not made fresh, and sold in the store that are bottled or canned will NEVER oxidize. This is because the juice has been heated to deactivate all the enzymes. The enzymes are one of the key reasons why making fresh juice with your juicer can be so beneficial. Other benefits are some of the phytochemicals, phytonutrients and antioxidants that can be lost during commercial processing. I will attempt to explain they various styles of juicers on the market today, how they work, and a brief overview of their advantages and disadvantages. The centrifugal juicer design is one of the oldest juicer designs. This juicer uses a grater or shredder disc and a strainer basket with straight sides to hold the pulp in the machine. The shredder disk is at the bottom of the basket, which revolves at a high speed (3600 rpm). The produce is put into the top of the machine, and it pressed through a chute, hits the spinning shredder disc, while the produce is being shred, juice is released. The basket spins at a high speed, much like a washing machines spin cycle and force pushes the juice through the strainer basket, and comes out of the front of the machine, and the pulp stays inside the machine. Generally this style juicer can make 1-2 quarts before the juicer must be stopped, and the pulp must be removed before further juicing can take place. This is not a continuous juicing appliance. The two centrifugal juicers we sell are the Omega 1000 and Omega 9000. These machines use stainless steel baskets and ball bearing induction type motors. The Omega 1000 offer a 10 year warranty, and the Omega 9000 offers a 15 year warranty. This juicer is good for juicing most fruits and vegetables. This style juicer tends to inject air into the juice so it reduces the nutritional content and oxidizes the juice. Made popular by the "Juiceman" Infomercial in the 1990's and the Jack Lalanne Infomercial in the 2000's... The centrifugal ejection style juice is the next juicer we will be explaining. This juicer operates much the same way as the centrifugal juicer above operates, except for the sides of the basket is slanted. This allows for the basket to be "self-cleaning", so there is no need to stop the juicer and empty it out. The pulp is ejected out of the machine, usually into a collection bin or basket, that can be lined with a plastic bag to collect the pulp, and then easily discarded. Due to the short contact time of the pulp in the basket, these juicers need to spin faster than the centrifugal juicer, at 6300+ rpm. This style juicer is the noisiest of all the juicers. The Omega 4000(15 year warranty) and Lequip 110.5 (10 year warranty). Much like the centrifugal ejection juicers, above, except it has the addition of a large feed chute which is 3" in diameter, which allows the user to juice without cutting the produce. Due to the larger feed chute, the RPMS are also increased, which can be as much as 11,000 RPM. There are benefits and drawbacks to the large feed chute. The units we offer with the large feed chute are: Lequip 215XL (10 year warranty) and the Breville Juice Fountain Elite (1 year warranty). To read more about the advantages and drawbacks of the wide feed units, click here. The centrifugal ejection juicers are the easiest to use and easy to clean, and are fast. They are good for juicing most fruits and vegetables. This style juicer creates a less nutritious juice than the slow juicers. The Champion Juicer, made by Plastaket, combines three operations into one. The Champion Juicer first grates, then masticates or chews the pulp to further break down the cell-wall structure, and then mechanically presses or squeezes the pulp to extract the juice. The Champion uses a powerful 1,725 RPM motor and requires moderate strength to operate. It is definitely not a machine for a physically limited person. It can juice almost every type of vegetable efficiently, including leafy vegetables. By blocking off the juice spout (with the blank or solid plate), the Champion can be used as a homogenizer to make such foods as raw applesauce, tomato sauce and baby food. It can make peanut butter or other nut butters. It also makes wonderful ice cream-like desserts from raw frozen bananas and other fruits. By assembling the Champion without the blank or juicing screen, it can be used as a grater or to make shave ice. The Champion's motor is manufactured by General Electric and its juicing parts are constructed of stainless steel and nylon; it has been manufactured since the 1950's. It is best for juicing most fruits and vegetables. Plastaket also manufacturers a more powerful version of the Champion juicer, its the Champion Commercial model. The difference is that it has a bit more powerful motor. The look of the machine is the same, as well as all the external parts. Due to the way the Champion juicer works, it tends to oxidize the food more than the slow juicers, below. The press style juicer squeezes the juice out of the produce by pressure. The press juice, its a two step process: first the produce must be shredded then it is pressed. The Norwalk and Pure Juicer are electric two step juicers that combines grating and pressing operations into one unit, with this machine, the vegetable or fruit is first grated by a revolving cutter into a linen cloth lined tray, which was then placed into a motor-driven hydraulic press. Extremely high pressure is used to extract juice from vegetables (1,700+ PSI), The hydraulic press produced a high- quality juice from both fruit and vegetables, but it was a difficult and time- consuming machine to use and to clean. In addition, these machines cost in excess of $2200+, which is quite high for the average consumer. A good substitution for the Norwalk juicer, would be to use the Champion Juicer as a grater, and then the Welles press, which are operated manually that squeeze the juice out of the produce. While Grinding the produce at high speed 3000+ RPM can cause some oxidative damage to the produce, the pressing step causes the least oxidation of the juicing methods, and produces a pulp free juice, since the juice is strained through cheese cloth. This type of juicer juices fruits (especially soft ones) better than other types of juicers. This juicer produces juice by using a single auger that basically crushes the produce into the walls (or screen) of the juicer, and in the process extracts the juice. It runs at 80 RPM, so there is little oxidation. The single auger style juicer has been on the market as a dedicated wheatgrass juicer for many, many years now. Just recently, a new design of the machine allows the single auger style machine to juice wheatgrass as well as other vegetables and fruits. There are several brands of single auger juicers. The Samson 9001 (10 year warranty). This new single auger machine juices wheatgrass about as well as a dedicated wheatgrass juicer and does an excellent job juicing leafy greens. It will juice fruits and other vegetables about as well as the twin gear juicers (below). We found that this type of machine was not as effective at juicing carrots, as the twin gear units. (read more about that here) The juice made with this machine tend to be really pulpy and it is advised to use the strainer that is included. Fruits and non leafy vegetables need to be cut into small "cubes" for best results when using this juicer. We find that the single auger juicers, do not produce a high yield when juicing carrots, so if you want to juice alot of carrots, this is not the juicer for you. For best results when using this machine, the hard and soft produce needs to be "alternated" when feeding into the juicer. As with the twin gear units below, this machine is not the greatest for juicing fruits. 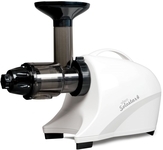 This juicer works like the single auger style juicer above, but upon the initial crushing of the produce, juice is directed through the stage one juicing screen into the juice cup. The crushed produce continues its way through the machine to the 2nd stage, where there is a finer holed screen to further obtain more juice. With the single stage auger juicers (above), the juice is only produced in this second stage. In our tests, this style juicer produced more juice and worked better than the single auger juicers. 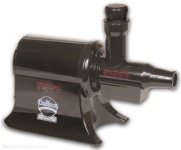 There are two brands that sell the dual stage single auger juicers. Omega offers the 8003 and 8005 model (10 yr warranty). The Omega models are identical except for the color. The 8003 is white, and the 8005 is a chrome color. The Omega 8004 and 8006 are the upgraded versions of the 8003 and 8005. They include a 15 year warranty, as well as an 8x harder auger. The latest version the dual stage single auger is the Omega NC800 that is easy to clean and gets a higher yield than previous Omega models. The more powerful, and lower RPM(58), Tribest Solostar 4 is more difficult to clean than the Omega NC800 but extracts even more juice than the NC800. We found that this type of machine was more effective juicing than the single auger style juicer. (read a sample test here). We prefer the Omega NC800 because it is easiest to clean in the class or the Solostar4 because it gets the highest yield in this class. This juicer is similar to the horizontal auger design (above) but has the auger vertically instead. This juicer runs at 80rpm. This has several benefits: First, the juicer takes up less counter space. Second, the juicer is better at juicing a wide variety of produce, such as leafy greens, hard vegetables and fruits. Third, total juicing time takes less time because the juicer can feed itself instead of you having to push produce into the juicer. The Omega VRT330(10 year warranty), Omega VRT350(10 year warranty) Omega VRT400(15 year warranty) were the first generation of this style machine that has a pulp ejection hole in the bottom of the screen that can have a tendency to clog. The second generation of this machine eliminated the pulp ejection hole in the bottom of the screen which minimizes clogging and the need to pre-cut produce into smaller pieces so it does not clog this hole. They also run at a lower RPM(43-47) than the standard vertical single augers. The Slowstar (10 year warranty) is the most versatile, most powerful and the lowest cost. The Omega VSJ843(15 year warranty) comes in a square and round design as well as different colors. It is a bit easier to clean than the Slowstar juicer, but does not include an attachment to make fruit sorbets and nut butters. Although it is a little easier to clean and produces less pulp in the juice. We prefer the Slowstar overall due to its lower cost and versatility. The newest style of vertical single auger juicer on the market is the Kuvings Whole slow juicer. The difference with this model vs all previous vertical slow juice extractors is the addition of a 3" wide feed chute. This 3" wide feed chute makes it easier to use the juicer with less cutting of produce to fit into the feed chute. This style machine has all the pros and cons of the Single Vertical Auger style juicers. The Kuvings Whole Slow Juicer b6000 (10 year warranty) and the Kuvings Whole Slow Juicer Elite c7000 (10 year warranty) are the only wide feed chute juicers we offer at this time. We find the c7000 model works better, jams less, and extracts a higher yield than the b6000 model. Kuvings owns the patent on wide feed chute slow juicers and other machines may be poor-performing knock-offs. These juicers have two gears that basically press out the juice of the produce. The screws turn at a low 90-110 rpm. It is very similar to two gears in a automobile transmission that mesh together. Basically, the produce is pushed (with some force) into the two gears, which first shreds, and then squeezes the produce. These machines are best for juicing vegetables since these machines rely on the fibrous cell wall to push the pulp through the machine. As a bonus, these machines will also juice wheatgrass (Generally a separate wheatgrass juicer is required to juice wheatgrass). The quality of the juice produced with these machines can be compared to the quality of the hydraulic press above. These machines are not for the"faint" or "frail" hearted as some pressure is needed to feed the produce into the machine. Machines in this category are the Green Star Juice Extractor (5 year warranty) , The Green Star Elite GSE-5000 (12 year warranty), Green Star Pro GS-P502A (15 year warranty), and Green Power KPE1304 Juicer (10 year warranty) . These juicers truly give "the best of both worlds" but there is one drawback: the price. They can be as much as two to three times the price of the Centrifugal or Mastication Juicers. While these juicers are best for juicing vegetables, the Green Power and Green Star machines have a fruit attachment available to help it better juice fruits. (We have successfully juiced hard apples, hard pears, watermelon with rind, and citrus successfully with these twin gear machines). We do not recommend these juicers if you want to juice a significant amount of fruit. The Green Star, Green Star Elite and Green Power KPE-1304 are also able to homogenize as the Champion above, and make raw apple sauce, delicious fruit sorbets, nut butters, baby food. We recommend the Green Star Elite, which is the latest design that uses 3 unique pressing stages. How loud are the juicers? The noise level of the juicers are all different. A good rule of thumb: The faster a juicer turns (Revolutions Per Minute) or RPM, the louder the machine is. Based on this, the Single Auger and Twin Gear Machines would be the quietest operating at ~100 rpm) , followed by the Champion (~2700 rpm) ,then the centrifugal machines (~3600 rpm) , with the centrifugal ejection (~7200 rpm) machines being the loudest. I have personally juiced with the Green Power while my roommate was sleeping, and it didn't bother them. I would never try that with any of the other juicers, as they are much louder! Read our article, "How loud is that Juicer in the Window" for the results of our juicer decibel testing. I find that my personal favorite, for fast, easy and quick fruit and vegetable (with minimal leafy green vegetables) juice making is the centrifugal ejection juicers. The Lequip 110.5 is my favorite centrifugal juicer. It's easy to clean and gets a good extraction from the produce. They will juice most fruits (including the skin) and vegetables. For more convenience, you may want to consider the Lequip 215xl, which has the larger feed chute which will save additional time. People who are primarily interested in leafy green and vegetable juices as well as wheatgrass, should seriously consider a horizontal single auger such as the Omega NC800 or Solostar 4. They were specifically designed to produce its highest quality juice from leafy greens and hard vegetables. The juice it produces from vegetables is darker, more concentrated, and contains less entrapped air than juice made with a centrifugal juicer. For this reason the juice has slightly longer shelf life. For people that want to juice leafy greens, hard vegetables as well as fruit, you can't beat a vertical single auger juicer for its versatility. I would choose either the Slowstar or Omega VSJ843 as they are the best performers in this category. For people that want the highest quality juice, the twin gear press. They are more efficient (especially juicing hard vegetables with leafy greens) than the other juicers mentioned. Since they operate at a low RPM, it is the quietest of all the juicers, and due to the low rpm, the oxidation that occurs while juicing is minimized (this maximizes the nutritional value in the juice). If you have the money, and you will be juicing mostly vegetables and some fruit. (This is not the machine for you if you want to juice mostly fruit - it was designed to juice vegetables) The Green Star Elite is the best juicer in its class. This juicer is best for hard vegetables with leafy greens, and are not recommend for people who want to juice mostly fruit. If juicing a combo drink, juice the softest item first, followed by the harder item and alternate them. (ie: apples then carrots). This is because the twin gear machine REQUIRES fiber (such as in veggies) to push the pulp through the machine, or it will back up. For people who are interested in changing their lifestyle, and interested in the Living/Raw Food Diet, I would highly recommend either the Slowstar, Solostar 4 or Green Star Elite juicers, due to the features besides juicing. The homogenizing feature comes in VERY handy for making raw/living food recipes. We personally like the Slowstar since it juices leafy greens and wheatgrass really well, and run at a lower RPM, as well as being more affordable than the Twin Gear juicers. If you want to produce high quality wheatgrass juice, a slow-turning manual-type juicer such as the Back to basics stainless steel produces the best quality. There are many motorized varieties of wheatgrass juicers such as the Miracle MJ-550 to make it easier to juice wheatgrass. The would generally recommend the multi-purpose Solostar 4 for people that want to juice wheatgrass as well as other types of produce. On a budget? Please read our budget juicer article to learn about the juicers around $100. that will give you the most bang for the buck..
Be sure to take a look at all the other articles we offer about juicers before making your purchase. We highly recommend watching the demonstration videos we have available so that you can become more educated about the machines, and see how they are used. Our videos contain the latest updates, information and testing of the juicers.